Toning and moisturising are essential skincare steps in my opinion and it is worth investing in good quality products that deliver on their promises. One brand that doesn't ever seem to let me down is Claudia Louch, with an effective range of skincare packed full of natural ingredients. These are high end products and as a result come with a high end price tag. 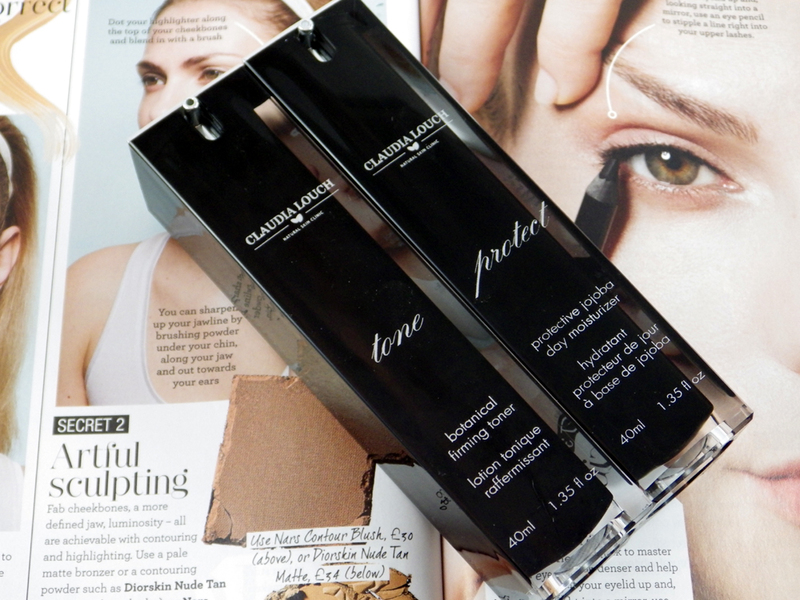 I've been using the Claudia Louch Botanical Firming Toner and Jojoba Day Moisturiser. Containing 94% natural ingredients and no alcohol, this toner contains ingredients such as Aloe Vera, Chamomile, Japanese Green Tea and Cucumber Extract to refresh, rejuvenate and firm the skin and tighten pores. The bottle has a pump applicator, so I apply this direct to a cotton pad and then onto the skin after cleansing. I didn't particularly notice any firming or pore tightening effects after using the Botanical Firming Toner, but when using this in the morning I found it revived and brightened my skin, soothing any breakouts and providing a good dose of hydration. I really liked the cucumber scent too. The only thing I would say is that the liquid itself is quite thin and I felt like I had to use a bit extra to feel it on the cotton pad. For me, this would be lovely as a spritzer and would perhaps work better in terms of application. Designed for oily to combination skin, the key ingredient of this moisturiser is Jojoba Seed Oil, which acts as an anti-inflammatory and helps to reduce excess sebum. It also contains Avocado Oil, Grape Seed Oil, Shea Butter, Glycerin, Vitamin A and Vitamin E. The Jojoba Day Moisturiser is the stand out product for me out of the two. The formula is of a medium consistency yet absorbs quickly into the skin, leaving it soft and supple. When using this moisturiser my t-zone doesn't start to get oily until late afternoon, whereas normally I'm using my translucent powder by lunch time. Yet my skin is still suitably hydrated. Clearly this really, really suits my skin and I have obviously been missing Jojoba Seed Oil from my skincare! Definitely one of the best moisturisers I've tried (along with HealGel Face). You can check out both of these products on Claudia Louch's website here. Have you tried any Claudia Louch skincare? I haven't actually heard of Claudia Louch, but I am forever on the hunt for new skincare! I've not heard of this brand but the ingredients of both products sound lovely!